If you haven’t seen the news, much of the Northeast is in the midst of what could turn out to be an historic winter storm. Well over a foot of snow is estimated from Maine to New Jersey. Both Connecticut and Massachusetts have instituted strict driving bans and all New York City area airports are shutting down operations Friday night. 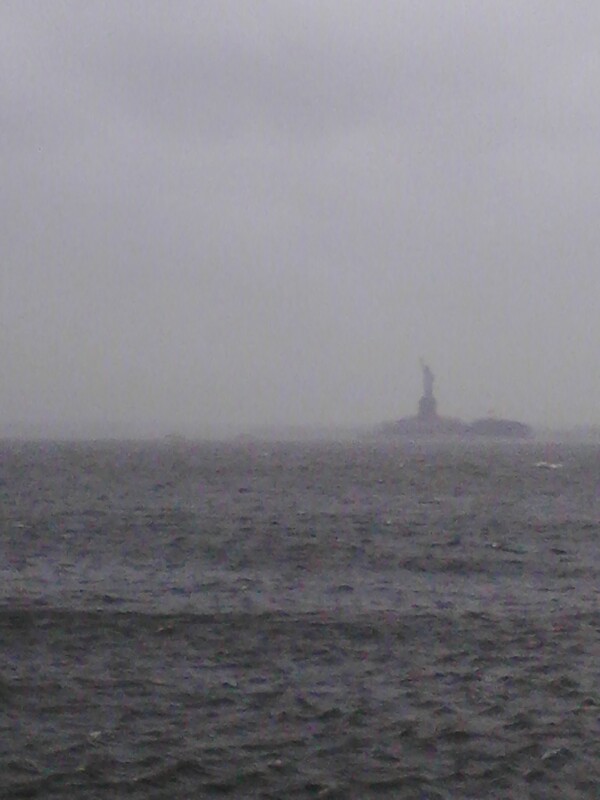 After Hurricane Sandy, government officials are taking no chances. http://www.geographicsociety.org/wp-content/uploads/2014/08/logo-300x98.png 0 0 The Geographic Society of Chicago http://www.geographicsociety.org/wp-content/uploads/2014/08/logo-300x98.png The Geographic Society of Chicago2013-02-09 00:05:412013-02-09 00:05:41The Statue of Liberty faces Winter Storm "Nemo"
The following post is the latest installment of an ongoing series here at the Backyard Geographer documenting seasonal ice formations on Lake Michigan. For previous coverage, see parts 1 and 2 from 2009-2011, and parts 3, 4, 5, and 6 from winter 2012-2013. The following series of pictures was taken on January 27, 2013. The air temperature is in the high 20s after similar conditions yesterday. 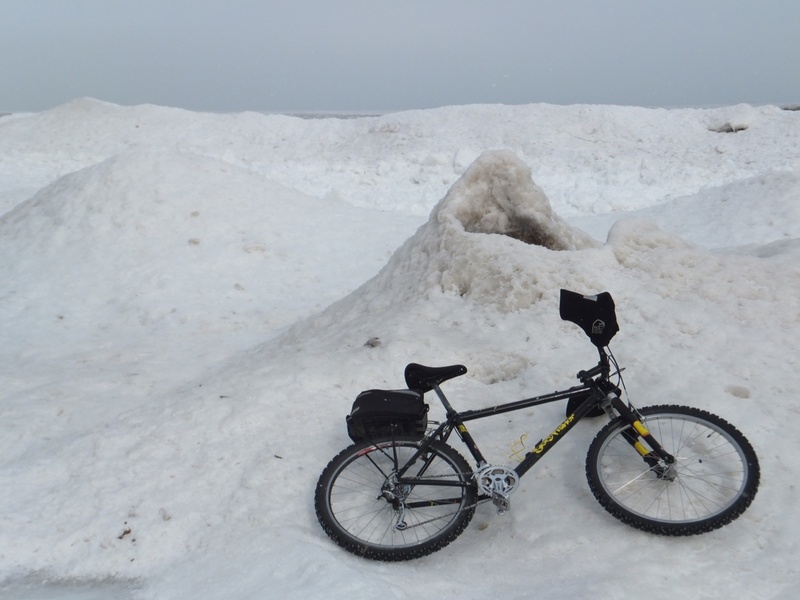 Lake Michigan water temperature is about 37⁰F. Even with air temperatures below freezing, water temperatures above freezing are winning the battle at the shoreline. 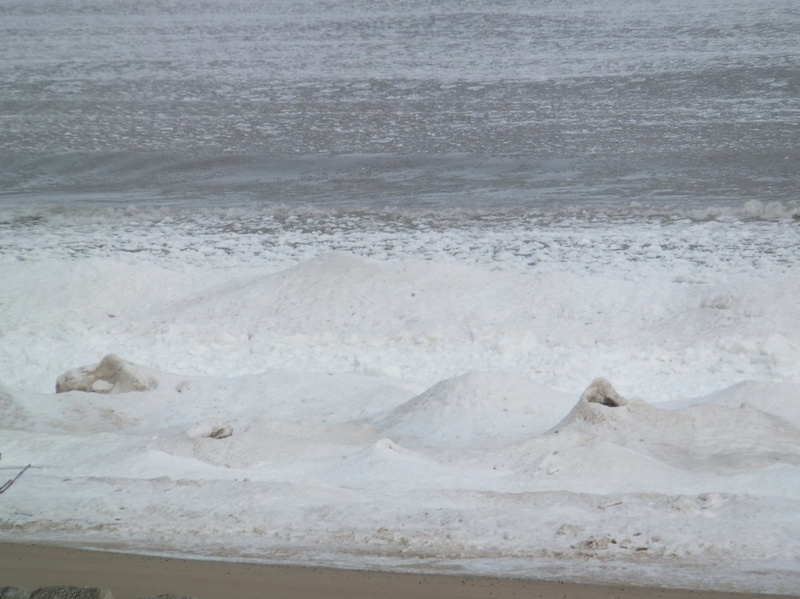 The impressive 12-foot tall ridge at the waterline only three days ago has melted back to leave these remnants stranded offshore by open water. Signs of ice demise are everywhere. The right side of this ice volcano is collapsing as relatively warm water melts the ice walls of the volcano’s plumbing system. One slab has collapsed forming the window through which the lake can be seen. The large block forming the ice bridge seems on the brink of collapse due to developing cracks. Temperatures are forecast to reach well into the 50s in a few days. Time will tell if any ice remain until the next cold snap predicted for later in the week. 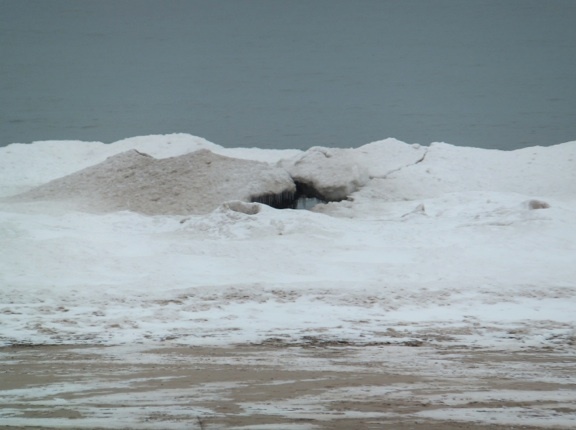 Over the next few days we’ll be posting installments of an ongoing series here at the Backyard Geographer documenting winter ice formation on Lake Michigan. For previous coverage, see parts 1 and 2 from 2009-2011, and parts 3, 4, and 5 from winter 2012-2013. The following series of pictures was taken on January 24, 2013. The air temperature on this morning was 10⁰F following several days of temperatures well below freezing. 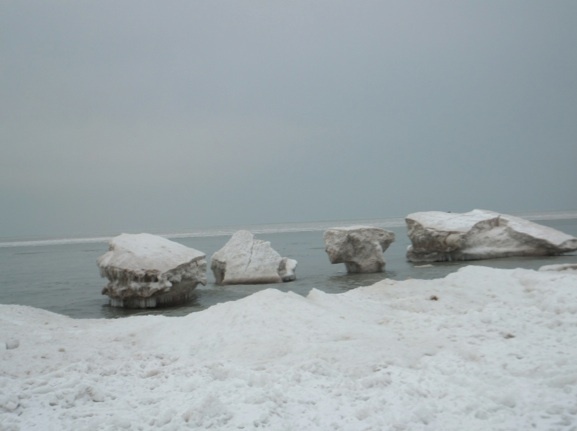 Lake Michigan water temperature is still about 37⁰F. 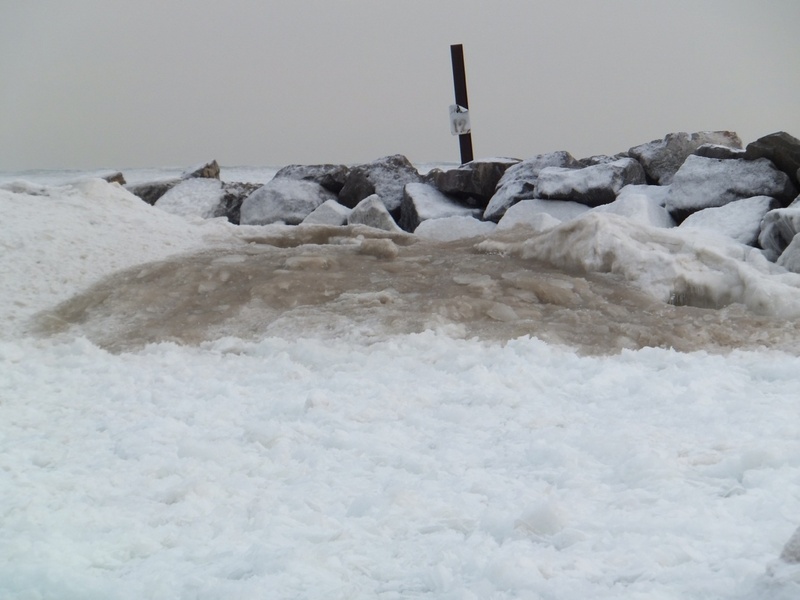 Frigid air temperatures, an abundance of floating ice chunks and onshore winds has caused shore ice to grow rapidly. 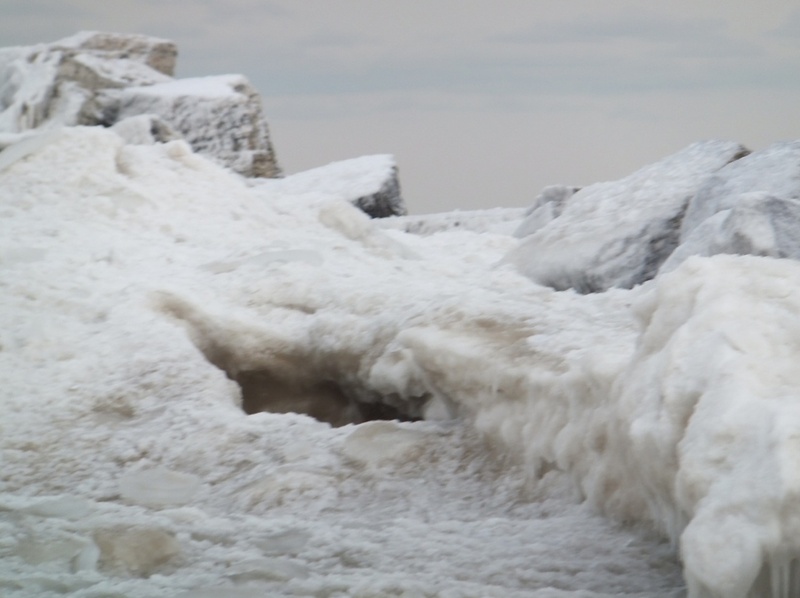 The ice shelf now generally extends anywhere from about 100 to 200 feet from the shore. This extinct ice volcano (the same as in the last photo) rises about 5 feet above the general ice surface. The ridge at the water’s edge about 75 feet in the distance is close to 12 feet high. 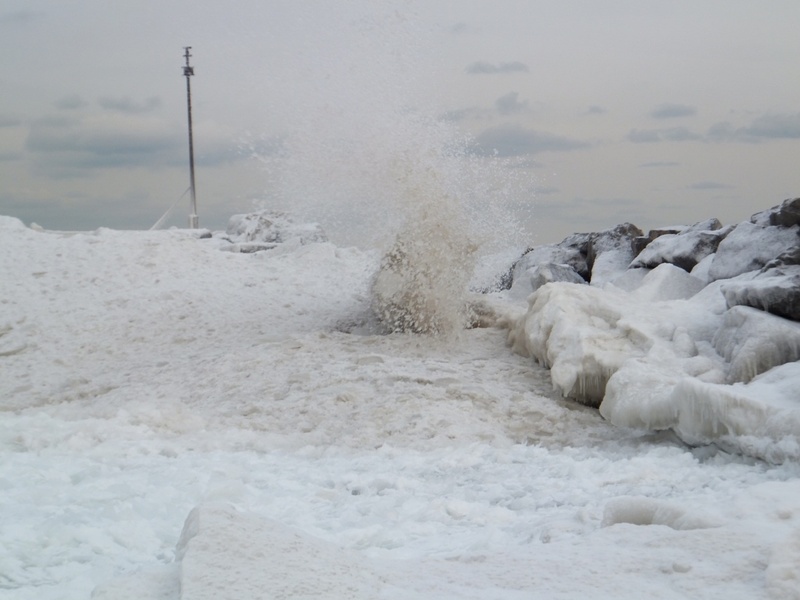 …erupts with a surge of spray, slush and ice chunks reaching about 10 feet into the air. Between eruptions, the water/sand mixture darkening the surface drains away and a fresh supply of ice chunks freeze to the flanks of the volcano, causing it to grow up and out.